A versatile All-American in college, Anderson was taken by the Dolphins in the third round of the 1968 AFL/NFL draft. He showed off his ability as a rookie, intercepting 8 passes for a league-leading 230 yards, including one for a 96-yard TD. 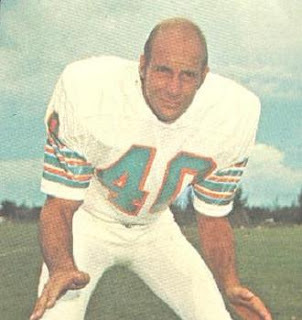 With the addition of Jake Scott in 1970, Anderson was shifted to strong safety and became part of an outstanding tandem. He again had 8 interceptions in ’70 and once more was the leader in return yards with 191. With the team going undefeated and winning the Super Bowl in ’72, Anderson was a consensus first-team All-Pro and was selected to the Pro Bowl for the first time. Dolphins went 12-2 to win the AFC East with the conference’s best record while leading the NFL in passing defense (1290 yards and 5 TDs allowed). Won AFC Divisional playoff over Cincinnati Bengals (34-16), AFC Championship over Oakland Raiders (27-10), and Super Bowl over Minnesota Vikings (24-7). Anderson followed up with a third consecutive Pro Bowl year in 1974, although for the first time in his career he failed to intercept more than one pass. A knee injury cost him the entire ’75 season and he was a backup for the last two years of his career in 1976 and ’77. Overall, Anderson intercepted 34 passes which he returned for 792 yards and three touchdowns.